There are many different types of gym equipment. Whether you are looking for equipment typically found in a school gym, or workout equipment typically found in a fitness center, we have what you need at American Fitness. Our most popular items include treadmills, weight machines, ellipticals, rowers, free weights, exercise balls, and other fitness accessories. If you are looking for gym equipment for a home gym, consider something adding something new to your exercise gear. If you have difficulty motivating yourself to workout, it's possible you just haven't found the right equipment. Doing the same exercise over and over can become boring over time. One of the best ways to keep your workout routine interesting is to mix it up. If you enjoy lifting weights, consider trying a kettlebell routine. If you enjoy cycling on a recumbent bike, consider trying a rowing machine, which will increase upper body exercise while still working the legs. If you are looking for gym equipment that will be used by multiple peoples, contact our commercial fitness department. We can help you choose equipment that best meets the needs of your users, as well as your budget. We are brand experts and can recommend products that offer all of the quality and durability of the more expensive brands, but without the high prices. 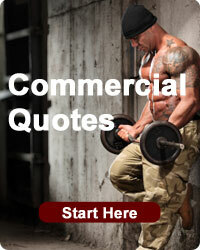 We accept purchase orders from qualified commercial customers and can provide custom quotes. 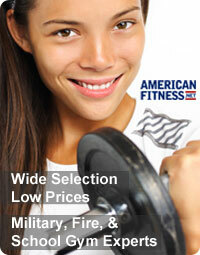 At American Fitness, we have a great selection of some of the top gym equipment on the market. We only choose brands with a reputation for delivering on our commitment to customer satisfaction. Whatever it is that you want, you are going to be able to find it here at American Fitness. Need help choosing? Our knowledgable customer service representatives are available 24 hours a day to help you identify the right gym equipment to support your health and fitness goals. Copyright © 1998-2015 American Fitness. All Rights Reserved.